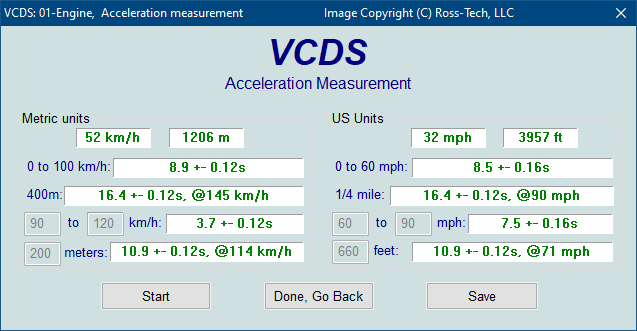 When you have one or more Measuring Blocks or Advanced Measuring Values with speed (km/h) in it, clicking on [Acceleration] will bring up the Acceleration Measurement window, which allows you to enter start and stop speeds and distances. After entering the values you want to measure, click [Start]. Next, do your acceleration runs in a safe and legal location. The "clock" will start counting when the car starts to accelerate. When complete, click on [Save] to save a copy of your results to your C:\Ross-Tech\VCDS\Logs directory. Use [Done, Go Back] to return to the Measuring Blocks or or Advanced Measuring Values screen. Note: The +/- tolerance shown is based on the sample rate of the data selected. Use a single measuring group and use these tips to get the fastest possible sample rate. Our testing at a dragstrip yielded results within the tolerance. Obviously, changes like overall tire diameter can greatly affect the results.